LankaWeb – And we say ‘aye’ to no-confidence motions against ourselves….! That’s Simon and Garfunkel and it’s from their song ‘Bookends’ which speaks of aging and nostalgia. The nostalgia part is something that we often encounter. For example, we have seen how the passing of years prompts remarks such as ‘never in our days,’ and ‘those were the days,’ if a line is required to lament the present. And if it is about people, we hear people say ‘they broke the mould when they made him,’ or ‘Here was a Caesar (or an Amaradeva)! When comes such another?’ (Shakespeare’s ‘Julius Caesar’: Act 3, Scene 2). We need to ask, however, ‘was there ever a time of confidence and confidences?’ When was history ever free of intrigue? When did righteousness reign supreme for any reasonable length of time? Sure, there was innocence and the innocent. There were people who were confident and those who could keep confidences. And yet, there was also dismay and despair. There was betrayal and shooting down of expectation. There was malice and mischief. Then, as now. ‘In another era he or she would have resigned!’ Haven’t we heard this over and over again? Well, in the ‘back then’ of reference, sure, people have resigned. And many crooks did not, isn’t this also true? Things were shoved under the carpet, the old boys’ network came to the rescue and bigger battles were left for another day. Big fish were left alone. But let’s talk of confidence and therefore of no-confidence. The threat of a no-confidence motion seldom made people fret. The power of numbers was insurance enough. However, we saw two senior ministers resign in quick succession. Neither of them acknowledged any wrongdoing. The government, for its part, clearly in damage-control mode, attributed the resignations to a wholesome political culture they claim to have created. A different explanation would be that given coalition-unease and rising disillusionment about the government any other course of action may have scuttled the government. One of the two worthies has since been put in charge of the subject of rural infrastructure development and he has seen fit to issue directives to his former colleagues in the cabinet. The other continues to hold important positions in the government outside of the cabinet, namely the Constitutional Council. Clearly, both have consolations prizes and clearly the political leadership has not lost confidence in them. It’s not over yet. Just the other day, Minister Sarath Fonseka said he would give evidence that would prove that former Army Commander, General Jagath Jayasuriya, was guilty of war crimes. President Maithripala Sirisena retorted, ‘I won’t let anyone touch Jagath Jayasuriya’ or any war heroes for that matter. Anyone guilty of wrongdoing during any military operation is no ‘war hero’ regardless of contribution to eliminating terrorism. The President could have worded it better, at least in the interest of affirming the basic tenets of good governance. He did not. More interestingly, the two statements clearly imply that Fonseka and the President are at odds. As such there’s two legitimate questions. Will Fonseka initiate a no-confidence motion against the President? Will the President orchestrate a no-confidence motion against Fonseka? Now, it is not the case that every disagreement should prompt no-confidence motions. This is serious stuff, however. There’s the charge of Fonseka pandering to interests that are not in concert with the country’s interests. The President, by presuming outcome of any reasonable process of inquiry, it essentially giving the finger to all notions of justice. No-confidence motions, then, are warranted. That’s tongue-in-cheek. It is easy to blame the people. True, they elected ‘these people’ (‘these’ is a term that could be applied to even those in the current Opposition of course). However, we have to acknowledge that people can vote for one person or a particular party for a number of reasons. 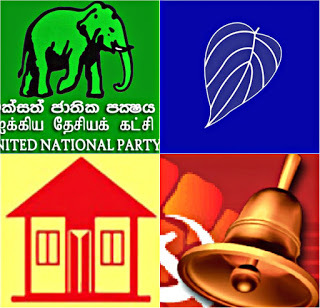 In January 2015, for example, they felt wanted to oust Mahinda Rajapaksa. Some of the self-labeled winners of that election claimed among other things that they received a mandate for things peripheral or un-mentioned in the manifesto. As for the manifesto, it is no longer a document that anyone can swear by, given the callous way in which pledges were abandoned or violated. Moreover, the entire system is structured in a way that the people don’t really have a fair choice. After being forced to vote for one set of crooks, brigands, murderers, wastrels and incompetents over another, after being forced to weigh relative merits, it is unfair to blame the voter and no one else ‘for electing these people’. On the other hand, it must be acknowledged that the ‘these people’ Nishan refers to, appear to have a lot of confidence in the people, i.e. the voters. Knowing very well that they have multiple pathways to retain political relevance (national lists, cross-overs or appointment to posts with plush benefits and/or opportunity for self-enhancement), politicians, especially of the two major parties and to a lesser degree the leaders of parties in coalition with then, can count on the people not to upset things too much. What’s an electoral defeat, after all, if the winner is an old friend or someone with whom it is easy to become friends? If politicians had confidence in the people for reasons more nobler than the assurance that they, the people, are not likely to stand in the way of pursuing purely personal goals, we would be living in a different country. It would be a country where mandates are taken seriously, where representation means something, and where the knowledge and expertise of the people of the country are taken note of. In this regard, there’s already our politicians regularly win votes of no-confidence against the citizenry. This brings us to us. The citizens. We have expressed confidence in our politicians, if not in a shout at least through whisper or simply an ‘X’ on a ballot paper. Sadly, we have reserved our votes of no confidence for ourselves, or rather for each other. We are not a ‘yes we can’ citizenry, at least not so in assertion and the transformation of affirmation into collective action. We are a ‘yes, we can’ people in many if not all spheres of social and economic activity, but we are a ‘no, we probably can’t’ kind of citizenry when it comes to politics. We needn’t be so forever, though. It begins, as always, with each of us as an individual and thereafter in the recognition of similarity in each other and eventually the coming together and moving forward. There’s a sign hanging outside the party headquarters and every election office of the two major parties and all parties and groups aligned with them. It’s a quote and not one from Simon and Garfunkel. It’s not from Shakespeare. It’s from Dante Alighieri’s 14th Century epic poem, ‘Divine Comedy: Canto III, Vestibule of Hell’’: “Lasciate ogne speranza, voi ch’intrate”, most frequently translated as “Abandon all hope, ye who enter here.” No, it’s not in Italian. It is in Sinhala and in Tamil. We just miss the words because we are distracted by the lies, the personalities and our fascination with pressing a button called ‘default option’. That, ladies and gentlemen, is how we vote ‘aye’ on no-confidence motions on ourselves. That’s how we let ourselves down. And that’s how we allow ourselves to be kicked around. We can do better. We deserve a more confident time; a time of confidences, yes.